8859 VR was an AEC Regent V 2D3RA with a Neepsend H73R bodywork originally with A Mayne & Son of Manchester. She was built in 1963 and delivered in January 1964 and is seen at the Wisley rally on 5 April 2009. Rumour has it this bus was exported to Japan for use as a sight seeing bus, not sure if that is true. "Rumour has it . . . ." Well, I didn’t know of that one. Our editor must have added that to my caption! Updates, anyone? So, another bit of our heritage gone overseas! ………and looking decidedly ropey, Pete! At least it’s still got its roof on ! Happily sister vehicle 8860 VR is in the care of Manchester Transport Museum. This shot came in without name or comment. I presume it was taken when 8859 VR was in service with Maynes, it is on route 213x to Droylsden Sunnyside Road and the pub behind is/was ‘The Royal George’ which was a Vaux pub at the time, can any of you Manchester chaps confirm if I presume correctly. The photo of 8859 VR is on Lever Street in Manchester where the direction of flow of the one-way system had been reversed. 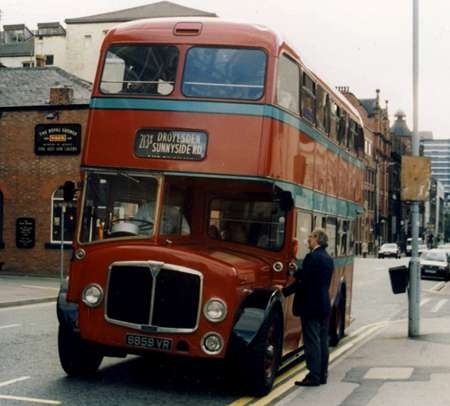 Hence the terminus had to move from its original location in Stevenson Square which is just behind the bus. The picture has come from the SCT61 site, it was taken in October 1995 by which time this bus was in preservation, it was running in connection with some sort of GMTS museum/Maynes joint event. Vaux did not acquire its Manchester pubs until long after Maynes had withdrawn their Regents! oops 8859 VR the shot without a comment, it was me !! sorry the comment seems to have floated away somewhere. Sadly this fine vehicle was indeed exported to Japan early 2013 approx. She was retained by Maynes and stored for many years at the Ashton road garage (now an Aldi supermarket) also at the Stuart street coach depot nearby, I visited the yard many times and stated it would be wonderful to see the bus on the road and actually was prepared to purchase the bus, Stephen Mayne told me the bus was his baby!! and would not be sold on. The bus spent some time at Maynes Warrington depot in the open and then on loan to the North West museum of transport at St Helens. She was looked after by a dedicated group of drivers and was cleaned and polished up and overhauled to take part in the 75th anniversary of Maynes running day she performed well only failing once. The photo I have submitted was taken on Lever street Manchester October 1995 whilst in service on the running day, I then jumped back on board ah that symphonic AEC gearbox and engine !! Sadly she went back into store as mentioned above and following the sad passing away of Stephen Mayne it seems the remaining directors had no interest in retaining a piece of company history such as the respected Dalaine family at Bourne, and the Goodwin family in Manchester. The bus was sold from St Helens to an enthusiast near Basingstoke I believe, finally ending up with bus dealer Mike Nash and exported to Kobe in Japan, she was used advertising a children’s charity initially, the plan was to use the bus as a London tour bus on Rokko island, she is most likely painted red by now!! But I have no further information to date, a sad loss if I had been aware she was for sale she may well still be here. As mentioned sister bus 8860 VR is there for all to see owned by lifelong Maynes enthusiast and expert Brian Lomas well done Brian for saving here, check out his amazing views of both vehicles on his Flickr page 8860 Brian. I have had an interest all things Mayne for many years (its an illness we all have this bus lark …but thanks to this amazing old bus photo site we can all chat and submit our photos, and information to benefit and enlighten us all many thanks) however I am desperate to view any photographs of F & H Dean of old church street Newton Heath bought out by Maynes circa 1960, but continued the Dean fleet until 1967 help please anyone!! As there has been a recent article about A Mayne & Sons on the ‘Articles’ page I thought this shot was appropriate. Here we have a rear entrance Regent V working its way through the busy streets of Manchester. The 2D model of the Regent V was 27 foot in length which would make getting through the narrow traffic laden streets of the city a little easier than the LD 30 foot model. 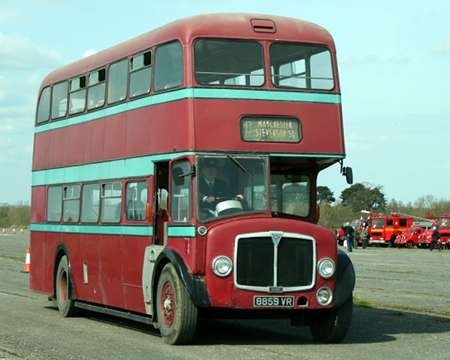 It is fairly obvious to say the least, that it had a Park Royal body the top deck is very Bridgemaster. Maynes had three of these Regent Vs registrations 6972-4 ND all delivered in December 1961. 2D3RA Regent Vs were 30ft long, most 27 footers were 2MD3RA (etc). LD3RAs were the original 30 footers with the earlier Regent III type A208 engine – as were the D3RVs of (for instance) Sheffield and Liverpool. The series 2 models were brought in on the introduction of the wet-liner AV590 engine (AH590 in the Reliance). Some confusion arose, initially, when some were known as 2LD3RA models but eventually all became known as 2D3RA. Similar confusion arose with later Reliances with 8U3ZR (coil springs) and 9U3ZR (12 metres) models eventually giving way to 6U3ZR for all variations and lengths of the 691 and 760 Reliances. We can blame BET for the Bridgemaster ugliness of these, and the East Kent, Regent Vs.
Regent V Mk 1: D and MD were 27ft long, LD was 30ft. Regent V Mk 2: 2MD was 27ft long, 2D could be either 27ft or 30ft. Maynes were 30ft, as indicated by the seating capacity. There’s no doubt about it, Mayne’s was (and is) a fascinating operator, worthy of interest but, I feel, very under reported through the years, in fact I don’t recall seeing pictures of any of their vehicles before the Regent V’s. It would be nice to see a fleet history also. Venture Publications produced a well illustrated history of Maynes a few years ago which also contained an abridged fleet history. Don’t know if there are any left, but it might be worth trying their retail arm’s website (mdsbooksales). If not the book is widely available on stalls at rallies etc as a second-hand item. Hope this helps. Talking about AEC Regent Vs, their designations, lengths, and capacities, I have a query which I have posted elsewhere, but, up to now, drawn a blank. Garelochhead Coach Services purchased six Regent Vs new, plus, I think, a second hand one later. The ones purchased new were of type MD3RV or 2MD3RA, i.e. 27-footers with the smaller engine. All are recorded as having been 64 or 65 seaters, apart from the penultimate one, 49 (DSN 657D), which has always been recorded as a 73 seater. In photographs it looks to have been the same size as all the other Garelochhead Regent Vs, and the only suggestion that there was anything different about it comes from the body number, which apparently had an ‘A’ suffix. Can anyone explain? Another independent bus operator but this time from the other side of the Pennines, A. Mayne & Sons operated in the Manchester area. I must admit I know very little about A. Mayne & Sons but I have two photographs of AEC Regent Vs that are worth posting, so if anybody as any information about them please leave a comment and I will add it as an update. This Regent had a body built by Neepsend formally Cravens of Sheffield South Yorkshire and the livery at the time if I remember correctly was a dark red body with three pale green bands, although I do stand to be corrected if you know better. Maroon with turquoise bands would be more accurate. In later years they adopted a red and cream livery which was much more modern-looking, but far less distinctive! Maynes sold their bus operation to Stagecoach four or five years ago, but the name is kept alive by the coaching operation based on Warrington, which is actually the former Barry Cooper business. There is a nice story that back in the 1930’s Manchester Corporation offered to buy out the Maynes business. The reply was that this was an amazing coincidence, as Maynes were thinking of making a similar offer to MCTD! Another piece of interaction between Maynes and the Corporation may be worth recording. 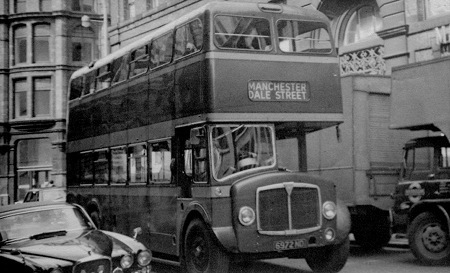 In the mid-1960s Maynes had a half-share in Manchester’s service 46 to Droylsden, as shown above, and also their own unnumbered service along the main road to Audenshaw, which ran in competition with Manchester’s trolleybuses. Since the trolleys operated under light rail legislation and were outside the Road Service Licensing system, this made Maynes the sole licensed operator of local (as opposed to limited stop) buses on the stretch of main road beyond the Droylsden turnoff. When the Corporation wanted to run motor buses on the trolley routes, they had to apply for a licence, to which Maynes objected on the grounds that it was their patch! This promised a real David and Goliath battle in the traffic court, but sense prevailed and a deal was struck instead. Maynes got the other half of the 46 (which they had always wanted) and both their objection and their Audenshaw service were withdrawn. I’m not familiar with the "half share" referred to by Peter – but as far as I recall only Maynes operated the 46 from Stevenson Square to Droylsden [Sunnyside Road]. During the early Selnec years Maynes continued to operate the route which was renumbered 213. The story I was told was that Maynes started the 46 route when Droylsden was still being built and the roads unfinished. When the roads were completed Manchester then wanted to operate the route as well. Maynes are said to have objected and won their case with the only restriction being passenger pickup only between City centre and Ancoats – outbound and passenger drop off only from Ancoats to City Centre – inbound. It is also interesting to note that up till the recent acquisition of Maynes local bus services by Stagecoach – Maynes original route 46 [subsequently 213] was their only local service which I think remained as such until the deregulation era. They then increased the number of routes between Manchester and the Ashton area. Of note is that ALL their routes went via DROYSLDEN, maintaining their original commitment to service this area. According to "The Manchester Bus" by Eyre and Heaps, the 46 was jointly operated by Manchester and Maynes from its inauguration in 1958. However, "half-share" wasn’t quite right, as I have found a table of joint services in 1962 which shows that the all-day service required 3 buses, of which 2 were Manchester’s and 1 Maynes. Maynes original route – started in 1926 – was from Newton Street to Kershaw Lane, Audenshaw, although inbound buses always showed "Dale Street" as that was where the alighting point was. I cannot comment on what the "Official" arrangements were between Maynes and Manchester – all I know is that I travelled between Stevenson Sq and Pollard Street quite frequently in the late 50s to late 60s and if not using the 215/216 trolley bus would take the 46. Invariably the return trip would be on the 46 as the trolley buses didn’t return via Pollard Street. If Manchester was in fact operating two out of three vehicles the odds are that I would get one, whereas in reality it was always a Maynes bus that came. What became of the 46 service started in 1933 as a shuttle service from Edge Lane to Manor Road which connected with the existing Audenshaw service. As that area of Droylsden developed the service was extended gradually until it reached Sunnyside Road. The inconvenience of changing buses at Edge Lane became an issue and in 1958 the service was extended into the City and was numbered 46 by Manchester Corporation who became a joint operator in the ratios previously described. Peak hour extras were additional and provided by MCT in summer and Mayne’s in the winter. As Peter has already said above, the 46 became worked exclusively by Mayne’s following the abandonment of the Manchester trolleybus system. Recently Buses Mag published an interview with Julian Peddle who at one time was Traffic Manager at Maynes, seemingly the financial arrangement with MCTD was that they paid Mayne’s a mileage rate who then paid MCT all their takings, an arrangement very beneficial to Mayne’s ! I was born and bred in Droylsden near the cemetery. 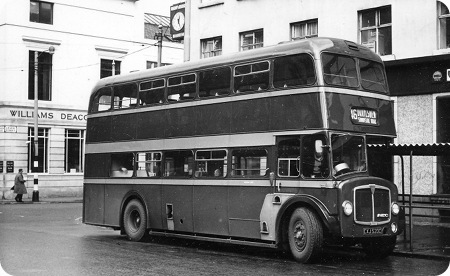 I used the 2 Maynes services for many years until I went to London in 1959. When the Edge Lane to Sunnyside Road changed to no 46 Limited stop from Stevenson Sq I came home from work on it. I used the 215 216 to go to the City as the Maynes was usually full by the time it got to our bus stop. Sometimes I used it to go home until no 46 started as the walk from the stop on Manor Rd was shorter. When at school I used the 216 to Ashton and the Hurst or Smallshaw Circular or walked to school from Ashton market. My uncle Bill was a driver for Maynes and if I was on his no 46 going home he used to stop earlier than the bus stop so my walk was shorter. My Dad and Arthur Mayne were friends. I use to use the Maynes bus in 1965 to get to work. I use to meet my father and we would go together on the bus from Sunnyside Road terminal to Stevenson Square and visa versa. Brilliant service and always full of people travelling in the early mornings and again at night. I now have a copy of the Maynes book by Venture Publications, and it gives a slightly different version from the Manchester book of the joint working arrangements on the 46, namely two Maynes buses and one Corporation rather than the other way round. Plus the peak hour extras referred to by David B. In addition to the services listed above, Maynes also had a road service licence for the Droylsden to Audenshaw Grammar school bus which was operated as what would be known now as a commercial service. I travelled to school on one of the Regent V’s every day on this service in the 1960’s. Later I found myself driving Fleetlines and VR’s for Maynes for a short while – very nostalgic with Ultimate ticket machines. In 1964 I co-organised a student- teacher PD1 Leyland decker trip to Moscow from Manchester and as I wanted to keep my PSV licence going, I drove part-time for Maynes Buses from 1965 until I left Manchester in 1978. At the time I was teaching first at Manor Road Primary and then at Bishop Greer Secondary in Gorton. I lived on Greenside Lane near the Clockhouse terminus. Mr Palmer was the manager under Arthur Mayne Jnr. and Alex was the mechanic. I drove on the last Kershaw Lane route (Dec 31st 1965) when they changed the route from trolley buses and swopped it for the 46 Droylsden Route. My first trip from Droylsden, Market Street to Mayne Road was a different story. I was given an AEC Regent II FT 571 with a quick crash box change and I could not find any of the gears. I got the timing wrong and could not stop with the vacuum brakes at Edge Lane Traffic lights. With the help of the passengers they directed me to Mayne Road. Phew! I thought my days of driving for Maynes were over, but they were just beginning. Last journey was on a Bristol VR to Rochdale VJA 666S. First new bus was on a Sunday morning in July 1965 Regent V CXJ 520C. It had air brakes and stopping was very fierce. I remember one man hitting the bulkhead as I braked for Market Street on route to Kershaw Lane, Audenshaw. Oh Dear !! I could share many comments as I drove all the fleet of deckers. My favourite was Ex Oxford synchro 27ft 7194 H. The pre selectors were also good ECY 874. Just a very small correction to John Brown (above), 7194 H had, prior to Maynes, been an AEC demonstrator, but I believe it did carry City Of Oxford Motor Services livery at the time.